Chicken is a staple food in most parts of the world. But sometimes accessing deli and other grocery stores when you are craving for a chicken is tricky. If you have the canned chicken, you are better off because this eases the whole cooking process. Canned foods generally are preferred today because they are readily accessible yet easy to cook. The whole process of cooking using the canned chicken is convenient, especially in this fast-paced world. The problem that most people face is that you can’t easily find a premium canned chicken. They will always contain some fillers or sauces that may not match the meal you want. Yes, they are healthy in fact it’s a healthy choice and fast choice. The good thing is that it’s affordable, accessible and contains all the nutrients that the fresh chicken does too. Although other people think that canned chicken is unhealthy, that’s never true. However, you ought to choose the chicken that has no sodium so you should always read the label. Understand that the chicken has the same nutritional value as that of your fresh chicken or roasted ones. 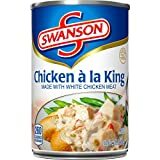 The only thing that will create the difference in your canned chicken is that the manufacturers add a lot of additives that may not be as tasty. Most of us are concerned about sodium phosphate in the canned chicken. Sodium phosphate is considered safe. The reason it’s added to the solution is to maintain the texture and shape of the chicken. If you don’t use the sodium phosphate, the chicken will easily mush up. It further balances the PH of your canned foods. The balance ensures that you extend the shelf life. You should, however, ensure that the percentage of the compound is at 2%. The chicken normally has the food starch. The essence of the food starch is to stabilize it or protect it from the heat or cold. It makes the chicken stable so that it can stand the difference in temperature and the abuse its subjected to during the canning. The canned chicken is your easy way to serve the chicken in a meal. The chicken is even lower in fat and calories. Generally, the canned chicken is a healthy, affordable and easy to store choice. It’s just not ideal for that person who has allergies, is sensitive or faced with dietary restriction. Sometimes I find it salty and that is a characteristic of almost every other canned food. You can easily divide the canned chicken to the following parts as you will see. Notice that there are a variety of chicken types in the market which makes it hard to classify them. But when it comes to the canned chicken you can divide them as below. You can have your canned chicken in raw forms. The reason being that there’s a massive number of people who don’t like the precooked chicken. This allows you to cook the chicken as you desire. The chicken used for the raw canned chicken is often just from the market. For this type of chicken, salt is used for preservation. Another option is to have the half-cooked kind of canned chicken. In half cooking the chicken, you reduce the time you take in cooking. With this canned chicken you can still personalize it with your different ingredients. This is the common kind that comes in the canned chicken. It’s often ready to eat and you might just need to warm it a bit before you eat it. This will reduce the cooking time and often times the chicken isn’t altered in taste and flavor. Today the gluten-free types of chicken are popular. More people are buying gluten-free chicken. This is a trend that is common for almost every other meal in the market. People are buying gluten-free meals. This is one of the best and premium chunks that are readily available. It’s further affordable. The list features black and white chunks of chicken. It’s ideal for those who dislike fatty foods. It further doesn’t have preservatives and artificial flavors. Most people prefer it for salads and sandwiches. It will blend well with the other parts of the meal and it’s rich in proteins. It contains food starch and sodium and it makes for the top brands in the market. The item is easy to store and open yet the chicken inside is very soft and tender. It doesn’t contain too many additives which makes it ideal for use with all your different recipes. You will have the flesh retaining the perfect shapes. Until it expires, the chicken is fresh and fluffy. It maintains a quality type of chicken breasts that is further unique. The way it retains its authenticity with such flavors is amazing. It remains natural to eat. You receive four in a pack of large chunks of chicken. This chicken is already cooked so your work is simply to eat it or spice it a little. The can has chunks of chicken premium meat that is not grown using the antibiotics. The can contains no preservatives and artificial additives. It further has no MSG and no artificial flavors. You will thank us for this chicken because you can use it as a sandwich, for lunch or dinner. This isn’t like most other chicken pieces where you have a few pieces of meat. Here, you will receive a chunk in every bite. It has an easy to open lid and store as well. You will find it in all the major stores in the country. There are a number of recipes you can try with this item. Its chunks of white meat and veggies bring out bold flavors of the meal. 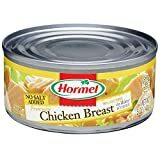 If all you are interested in is the best chicken breasts, Hormet has you covered with this can. Hormet is readily available and you can order it online or go to your nearest supermarkets to buy them. It’s a blend of both quality and quantity. This is the best brand for the chicken breasts and it comes being free of fat. Today the common thing about food is that people are concerned about the amount of fat and carbohydrates you consume. Luckily it comes without the additional salt and you will receive about 9 grams of proteins per servings. The chicken breast inside is soft and tender and you can use it for various other dishes. These cans have made it easy to cook your regular chicken. The fact that it retains its packages, doesn’t change its texture and the only thing it does to the chicken is improve its taste makes it ideal. The chicken breast has cooked meat that isn’t fluffy and lumpy like most other pieces. For those concerned about glute, this is your best choice of gluten-free chicken. It has a higher shelf life which means that you can store the cans on your counter for a couple of years. For those of you who are concerned about the quality standards of the canned chicken, you don’t have to hesitate with Kirkland. The USDA has inspected and certified it. You will have it in the larger tins of 6 pack. Here you receive the extra lean chunks of chicken breasts. It contains cornstarch and this makes it not a great product for those who have a gluten intolerance. This company is common because it provides you with the best quality of chicken. Its flesh will retain the good shape and it’s not fluffy or soggy in the package. This brings you closer to your freshly bought chicken. The chicken is packed under preservative water. Since it’s a common piece among consumers, you will find it available in most of your supermarkets. Its packaging is done with consumer safety in mind. It’s pure without artificial products to act as preservatives. You can use the chicken to cook several favorite dishes. Your taste and flavors are retained in the recipe you choose. The wild planet has a history of making great quality canned foods. In this can, you have all the chicken breasts and no additives or preservatives that alter the taste. The chicken used in the cans are grown on the land without pesticides and other GMOs used to influence the growth. Basically, we use organically produced chicken. It features an ecofriendly product. They are USDA certified. The chicken is roasted then placed in the can without the addition of water or any other liquids. The chicken, in this case, is savory and delicious such that you may enjoy it in your own recipe. It features the skinless chicken that is also boneless to reduce the consumption of cholesterol and unnecessary fats. You may use it to cook your soups or in your salads but most importantly in the burritos. It retains all its flavors and moisture making it maintain the shapes and texture. Naturally, the wild planet doesn’t add fillers so you can enjoy the protein content in the roast chicken. Here you receive another one of the fully cooked chicken pieces. If your concern is about the fat you consume when you eat chicken then you will have fun with this because it’s 98% fat-free. It further contains no added water and preservatives. The USDA certifies the product. It comes with only chicken pieces and sea salt. It maintains a rich aroma and taste of the chicken. The pieces are readily accessible. Since your major interest is on the right chicken pieces, you will get some soft and tender chicken pieces that are also all natural. You may use the white pieces of meat together with other ingredients to make your sandwich, lunch and dinner. The product prides itself of making high-quality protein and other nutrients. Besides, the meats when blended with veggies brings out the bold flavors. Keystone has great packaging that is also easy to open with a screw. It makes for the safest and healthy chicken that all members of the family may enjoy. It has one of the longest shelf-life compared to other pieces. For the best quality of white chicken in the can, buy Kosher club canned chicken. Apart from being delicious, the meat is your good source of protein. The canned chicken is ideal for Passover feasts. However, you may it year-round too. Eating these pieces makes it easy to consume the 26% daily requirement of the protein. This makes it an ideal choice if you have a high protein diet requirement. You have every reason to enjoy the meal in a clear conscience because it has no additives. What’s more, no corn or other wheat product is used in its preservation which makes it ideal for those with gluten resistance. Whenever you are hungry and you need to fix a meal quick you may use this product since its precooked already. Your chicken pieces retain all the perfect shapes without being fluffy. With this one, you can even pre-heat it and get down to enjoy your meal. The chicken is made flexible so that you can use it in different meals. You can use it with salads soups and other tasty dishes. When you are looking for a premium quality chicken look no further than nutristore chicken. We are calling this one the premium quality because it has been tested for microbes. 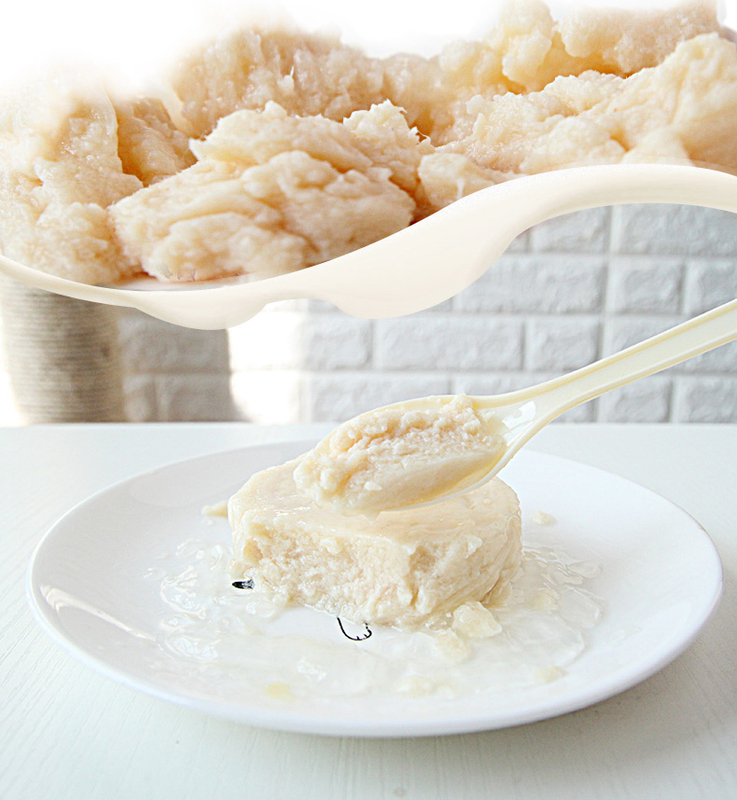 Everyone will enjoy the freeze-dried chicken. This canned chicken is ideal and versatile since you may use it when you are going camping, in case of emergencies and you may also use it as emergency food. The canned meat has the longest lifespan of 25 years. The meat here is prepped and ready to use in your favorite recipe of choice. It will work best for your favorite DIY meals. Even though it may last up to 25 years, the chicken assumes the original natural chicken taste in a matter of minutes. It further maintains its original texture. You can even use the meat pieces in your favorite family recipes. Remember the chicken has no additives, therefore, its free of gluten and cholesterol. Who said your freeze-dried food has to be boring? Mountain house canned foods make it easy for you to enjoy all the flavors like you have in your personal kitchen but packed in the can. They maintain the fresh flavors and the fact that they make the cans light is an advantage. This makes it easy for you to enjoy the emergency meals pantry and it’s, therefore, a survival kit. The secret to buying this item is to buy them in bulk especial because it maintains one of the longest shelf-life in the canned foods sector. The can is easiest to open so you don’t need the screw. Once you open it just remove the oxygen absorber. Add some water, stir it then give it time to reconstitute itself. 10 minutes is enough for you to have a savory meal. The meat is ready to eat as it has been precooked. The shelf-life is about 30 years. If you like to travel hunt or camp this meat has you covered. Before you settle on a particular canned chicken piece, you ought to conduct your own research. Considering the fact that some of the canned chicken meat is consumed directly from the can, you should confirm that the can is corrosion resistant. Only go for items that are packaged in containers that enhance its shelf life. Ensure that if for example the meat is packaged in a plastic container, it’s BPA-free and FDA approved. At the end of the day, the only reason you are buying the canned chicken is because it will give you the protein nutrients quickly. Therefore, it’s better to have a canned product that doesn’t compromise on the natural nutrients of your chicken. 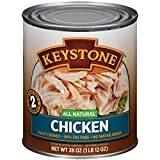 Canned chicken is often ideal like all other canned foods because they save you and give you an alternative option when you don’t know what to cook and eat. Therefore, you want those that can stay for at least six months on your pantry. This method makes cooking easy and quick. Because most of the time you have the chicken precooked thus you won’t spend a lot of time cooking. Also, you don’t need to wash a lot of utensils you have used during the cooking. The additives the canned chicken has if any should allow you to use the chicken in whichever recipe of your choice. The same way you would use the fresh chicken is mostly the same way you can use the canned one. This canned chicken advantage is that you don’t have to cook it fast. The liquid that is usually preserving the chicken could be used as a stock and add it to the soup or casserole. You may use the canned chicken in soups. You can also make a sandwich from it. Although canned chicken is mostly cooked and therefore lack the possibility of microbes that normally cause food poisoning, you should still exercise caution. Maintain hygiene when handling the cooked chicken so as to avoid diseases. Wash your hands frequently and cover your leftover then store them in the refrigerator. Avoid cans that have deep dents on the seams as this may have already allowed the bacteria in. Rusting is sometimes inevitable with the cans but to be on the safe side, discard the heavily rusted cans as they are already hazardous to you. Remember to keep the cans in a cool and dry place. If you realize that your can is swollen, you should discard it because it’s possible that it already has bacterial contamination. For your unopened cans, you should keep them on your pantry that’s a cool and dry place. For your opened cans, you should refrigerate the remaining contents. Instead of using the same can, though, you can change the remaining content in a plastic or glass jar then put it in the fridge. Once you have opened the can, do not store the contents in the refrigerator for more than four days. If you love the southern comfort dish, this is yours to enjoy. Simply put, you make the chicken casserole in the cast iron skillet. You can then top the mixture with a biscuit crust thus making it crunchy. When you add the canned chicken to the recipe, your food becomes even better. I think everyone will agree with me that pizza has been a comfort food for a long while. Although it used the canned chicken and canned alfredo sauce, the pizza is meant to be a low carb one. Moreover, it’s a gluten-free pizza that is also grain free. It takes you only 10 minutes to prepare. How easy can cooking get? We all like to have the shortcuts to the meals and this is just one of such types. Not only does the meal look good, it’s delicious as well. This is basically the chicken version of the crab cake. Here you make the breaded chicken mixture. This then makes the tiny Chicken cakes. Next, add the great sauce that you already made. Lastly, we have a noodles recipe. It looks like the easiest recipe to make to me and yet it will make you lick your fingers. You simply cook your noodles according to requirements then cook the canned chicken the way you would love it. Place it over the noodles and remember to add alfredo sauce when you are still cooking.